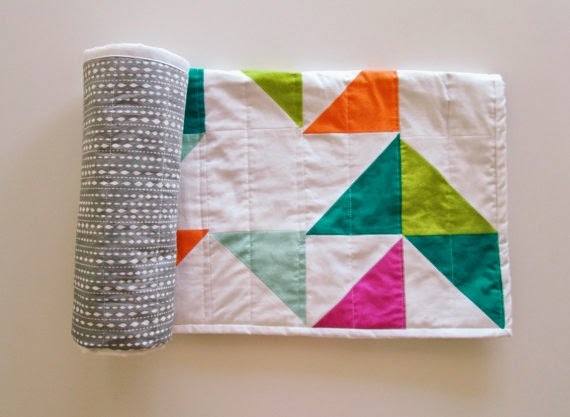 Four months ago, I made this baby quilt for AA. I loved making it; AA loved playing on it; naturally, I felt inspired to make even more. I had this thought in my head that baby blankets weren't really just for babies. They're for families. 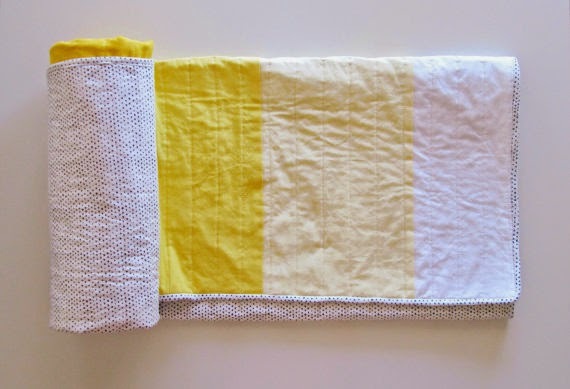 Blankets go everywhere with babies: through all the different rooms of the house, while they travel, to the park, to grandparents' and aunts' and uncles' houses. Not only that, but eventually babies become toddlers, who become kids, who become teenagers. 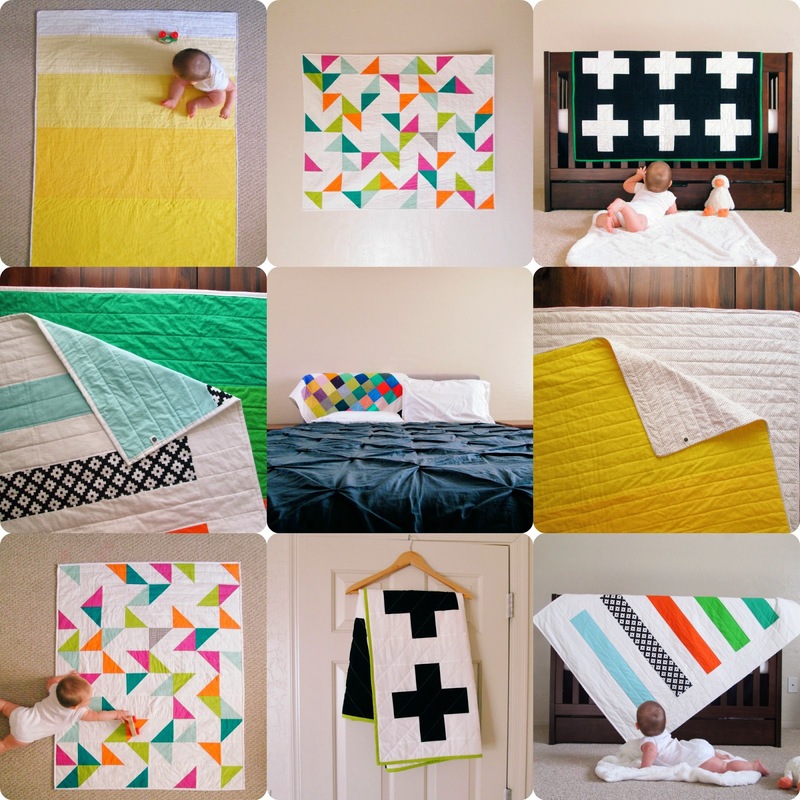 With that in mind, why not make a quilt that a baby would love--using bold colors and a geometric pattern--but with a modern aesthetic that would fit into a family's living room as part of the decor after baby's gone to bed? 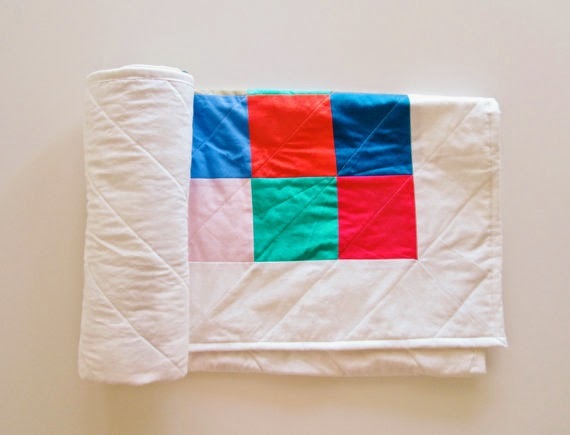 A quilt that could be well-loved throughout a child's life into adulthood, without being covered in cartoon giraffes? I threw this line of thinking out to my friend Kendra, and she immediately shared my vision, so what else was there to do but partner up? That's when VK MADE was born! 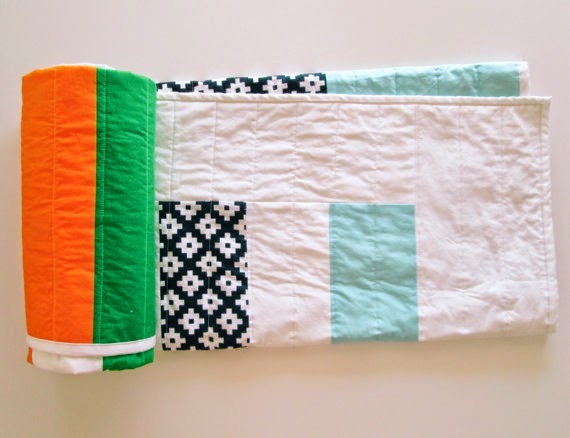 I've been using up all my scraps like crazy making little baby quilts! 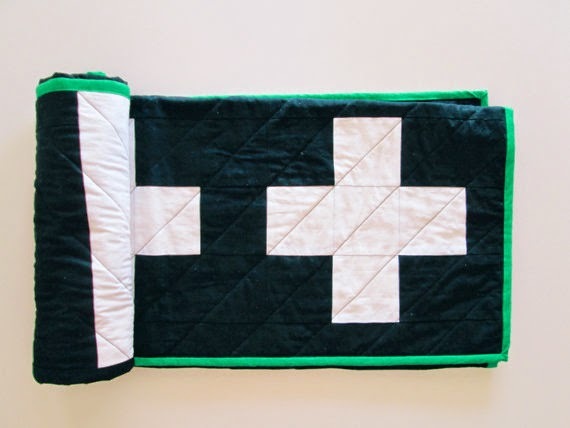 Here's a third in the very same design as this quilt and this quilt. This time, I used scraps from several different places: all the solid colors are leftover from various versions of Heart-Shaped Waistband Skirts from my Etsy shop; the white print and pale mint stripes are both from my 20-Year Quilt; the border, binding, and back are the spare fabric I had after making this collection of bridesmaid dresses. What a mash-up! 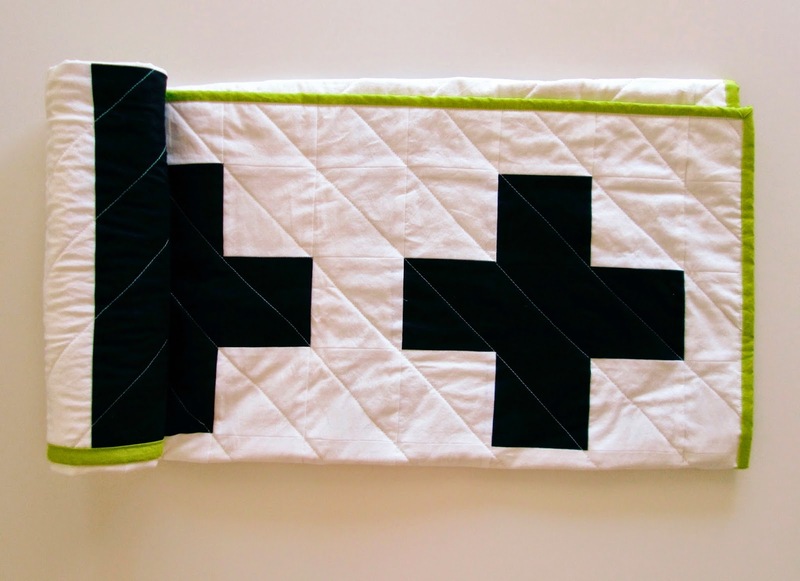 The most fun detail is that it's quilted in yellow stitching! Normally I just use off-white, but this whole thing was already so colorful and bright, it seemed only natural to have another happy little color contribution. In an effort to continue making simple, quick-to-construct clothing that will suit this desert climate (we've already hit 100 degrees several days! ), this week I took on Madalynne's Vera Aveline tutorial. 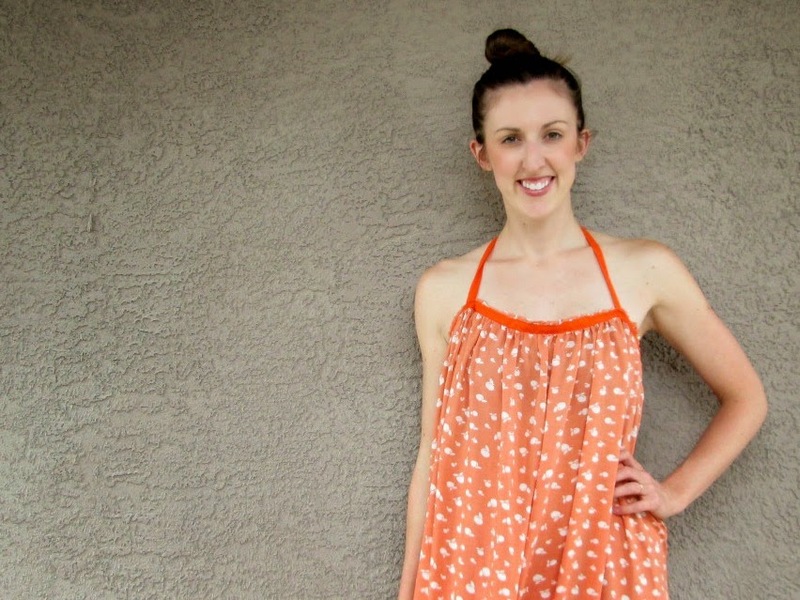 This dress is so simple--literally two rectangles of fabric sewn together and attached to straps--and the result is a super flowy, comfortable dress. My fabric choice made this so light and airy as well (p.s. the print is peaches!). While this isn't super practical for me right now in terms of my day-to-day, I think this dress is just begging to be worn while lounging poolside this summer, perhaps with some sort of cabana situation involved. In fact, I already tested that scenario out and am wearing my swimsuit underneath in these pictures - holla! My favorite feature is probably the t-strap in the back. I love the way it hangs and the way it splits the shoulders. Can't get much better than a two-hour make that turns out as floaty as this dress. If I'm ever pregnant in the summer again, this would also be so fabulous to make again and again and again for every day of the week. Thank you to Maddie for sharing this tutorial with the internet! I'm so happy to add this one to my closet! 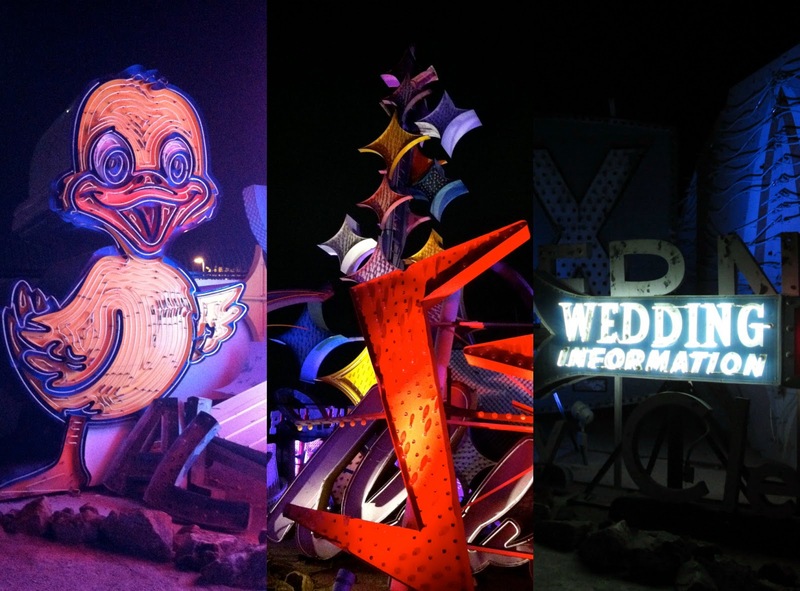 This weekend we went to a delightful little corner of Las Vegas: The Neon Museum, aka the Neon Boneyard (because it's where neon signs go for their final resting place). Apparently, this place was also made famous by this season's finale for The Amazing Race? Sweet! 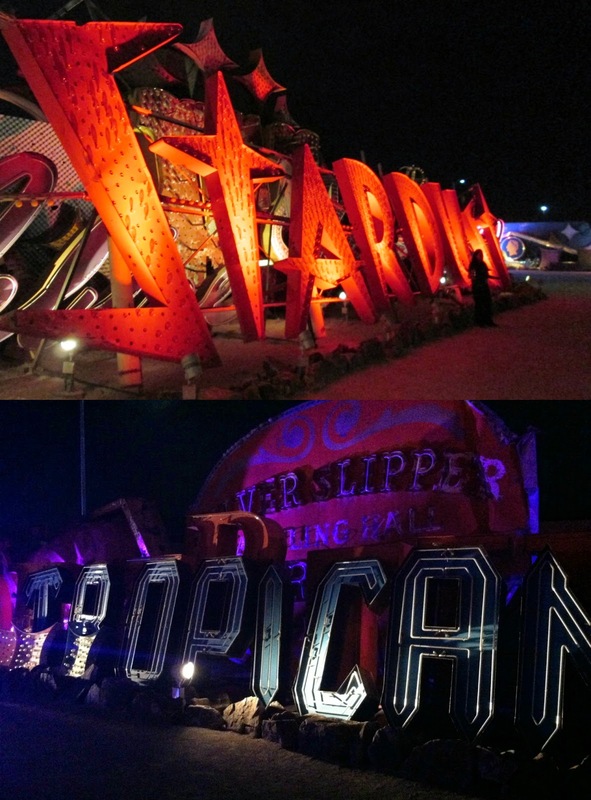 The Museum is basically a giant collection of old signage from all around Las Vegas - going back around 80 years - all artfully arranged in a big junkyard. So, it's awesome. The only way to visit is by guided tour, which I at first thought was sort of annoying, but as it turns out, our guide was fantastic and the anecdotes and unique history of Vegas she provided were so fascinating and so much fun to listen to. There is so much nostalgia with all those old (now defunct) hotels and casinos! 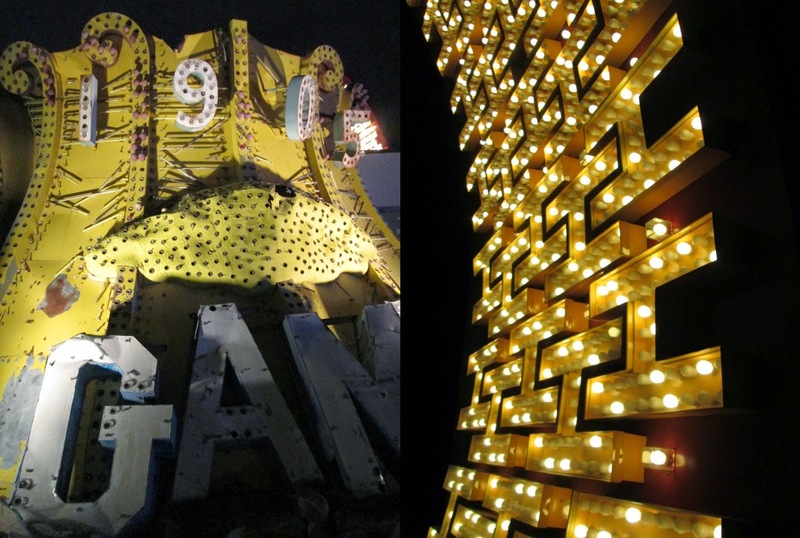 One of my favorites was the sign from Vegas' Moulin Rouge. They have rearranged the letters of it, though, so that it says "in love" - how precious is that?! The tour guide said people get married in front of it all the time. Awwww! 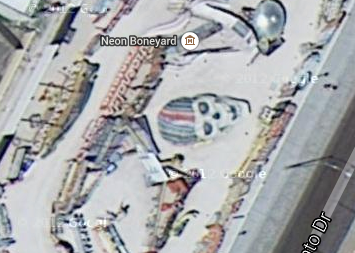 The Neon Museum is on Las Vegas Boulevard, just north of the Strip and not far at all from Fremont Street area, so it would be super easy to make a stop by here even if you were just on the regular Vegas vacation down on the Strip! We've spent the last few months watching a gigantic ferris wheeler sloooooowly being built down on the Strip, hoping hoping hoping it would be finished before we move in August. And it is! Here's the punnily named High Roller. 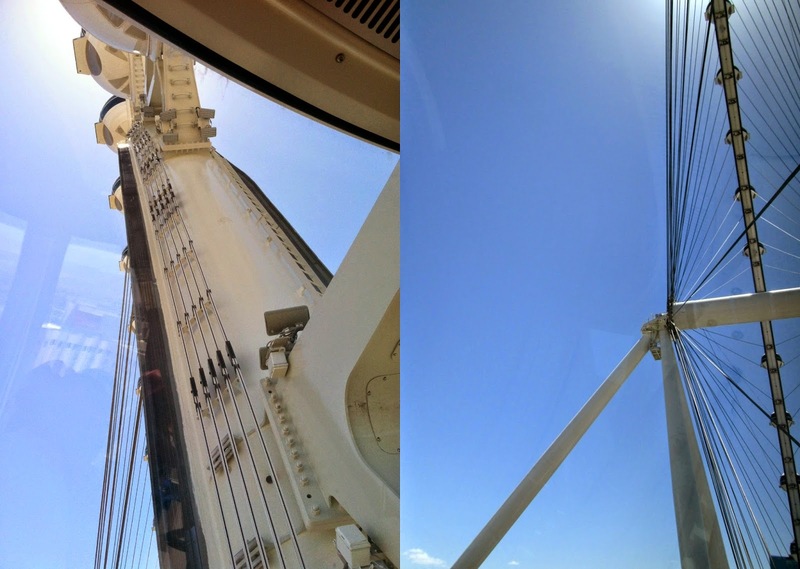 It's the largest observation wheel in the WORLD at 550 feet. I'm a sucker for a great view of a big city, and this is the best way to get it, no doubt. It took about 30 minutes to go all the way around, and the cabins have windows on all sides so you can walk around and get any view you want. Up to 40 people can stand in each pod, but there were only about a dozen in ours (maybe because of the time of day we went - Sunday at noon), so there was plenty of space to move all around. Even AA loved it! Or at least didn't cry about it (which is basically what we use to judge if he likes something or not at this point). He seemed so fascinated looking out all the windows and really seemed to like looking down - I'm guessing he didn't quite understand how high up we were, haha! Or he just loves heights and we have a dare devil on our hands. We decided to ride during the day time so AA could come with us (and also because moms rode free on Mother's Day - YES PLEASE) and we loved being able to see all the way to the mountains, but how breathtaking would this be at night with all the lights?! Maybe we'll ride again for a little date night. We highly recommend you put the High Roller high on your list of things to do when you come to Vegas. It's a welcome break from the busyness of walking along the strip, and so nice to be out in the sunshine with all the views instead of stuck in a smoky casino - for at least a little while! Summertime Dress: Take 3 - Romper Version! I made another of my Summertime Dresses! This time, in a kitschy little pineapple print. And also, this time, as a romper! I did wear this in public yesterday, but I'm thinking maybe it should be reserved for activities that are related to a pool or an ocean. It just seems better suited for a cabana or a lounge chair than for walking the grocery aisles! I've now drafted myself an actual pattern for the crossover top (on the previous two versions, I just kind of cut and prayed for the best), so I can make as many of these as I want! The bottom half came from these previously made shorts that I used to sell in my Etsy shop. Easy to combine into one romper! At least one more version of this Summertime Dress to come now that I have all the kinks worked out! Is it too much to say that I think Mother's Day (my first as a mama!) was one of the best days of my life? Because I think it might have been. Nothing truly spectacular happened, but it was just one the happiest, most fun, love-filled days from start to finish, and I felt so, so, so blessed. We spread out some paper to protect the table, squeezed out a couple puddles of (nontoxic, washable) fingerpaints, and basically just let AA go to town. It was truly one of the cutest things I have ever seen in my life. He did not understand the concept AT ALL, which was hilarious in itself, and the sheer amount of paint he was eventually covered in and how quickly he became covered in that paint were both pretty incredible. I told Scott today that this is now my most cherished possession in the entire world. I will never, ever, ever, ever get rid of this beautiful mess, and I'm so grateful for the memory of its creation! And of course, for the artist himself, for making me a mother. Here you'll find what I've been stitching up (that's "threads"), what has crossed my mind that day (that's "thoughts"), or mentions of the blessings in my life (that's "things I love"). I live in Las Vegas (for now) with my husband Scott, who is a teeth doctor, and our son, a chubby little thing we call AA. This is a peek into our day-to-day.